WELCOME TO OUR DENTAL PRACTICE! At Dr. Sachdeva’s Dental Surgery, our priority is to deliver quality oral health care to informed patients in a professional, comfortable and convenient clinic setting. Dr. Sachdeva listens and responds to your dental problems. He is an experienced dentist who knows the dental health field and can deliver effectively and treat your needs. Our dedicated team of well-trained professionals gives you individualised attention you deserve. We want to help you achieve the healthy and attractive smile you’ve always wanted in a way that make you feel comfortable. 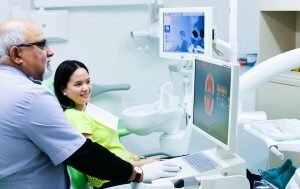 Our aim is to take people who have fear of the dentist and make going to the Dentist a pleasant experience while making them feel confident to smile again. We want you to overcome a bad dental experience and have the look and feel you’ve always wanted. Dr. Sachdeva’s mission is to create trusting friendships with our patients and inspire them to a lifetime of healthy, beautiful smiles.